A look at one of the maps showing various sections of the West Shore Fault. The Lake Tahoe region has the potential for significant earthquakes and has seen several temblors in the last 150 years, according to the state of California and various reports. A magnitude 6.0 earthquake in December 1948 west of Reno reportedly caused damage in Lake Tahoe communities, and quakes estimated at magnitude 6.5 and 6.3 happened in 1887 and 1857. More recently, a 6.0 earthquake hit in Wells, a rural town in Eastern Nevada, damaging hundreds of homes and rupturing gas and water lines. A slew of smaller quakes in the 3.0 and 4.0 ranges have struck in and around the region the past decade, including a swarm just last week in Reno, highlighted by a 4.4 magnitude temblor. 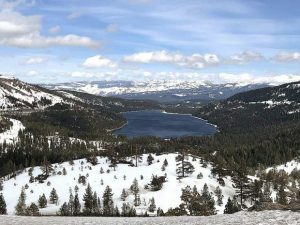 LAKE TAHOE — Maps released by the California Geological Survey this month detailing where earthquake faults have ruptured the surface of the Earth on the California side of the Lake Tahoe Basin may impact where new development occurs. 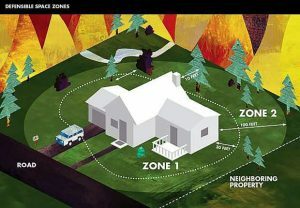 If new construction, or an extensive remodel, is planned within an earthquake zone designated by the two Alquist-Priolo Earthquake Fault Zone maps, a site-specific study is required to determine the specific location of the underlying fault and guide measures to help prevent earthquake damage. “These maps are a planning tool for a specific earthquake hazard,” California’s State Geologist John Parrish said in a statement. “We create zones in areas where earthquake faults have ruptured the ground in the past. The zones define where site-specific investigations must be undertaken to ensure that new construction for human occupancy does not take place atop the surface trace of an active earthquake fault. One of the fault zones identified in the maps is a portion of the West Shore Fault, which runs from the southwest corner of Emerald Bay to Fallen Leaf Lake. Another be found in the Emerald Point area, and a third runs south from Lake Tahoe midway between Eagle Point and Baldwin Beach. There is another earthquake fault zone that runs southeast of Fallen Leaf Lake. A sixth zone runs by Angora Lakes, west and south of Celio Ranch and east of Lower Echo Lake. The maps can be viewed atconservation.ca.gov/cgs/rghm/ap, which also includes history behind the Alquist-Priolo Earthquake Fault Zoning Act. Disclosure that a property is within an earthquake zone must be made in real estate transactions, and one of the most common concerns from residents and developers in areas with Alquist-Priolo maps is the maps’ effects on property values, said California Geological Survey spokesman Don Drysdale. “It hasn’t borne out in our experience that this affects anyone’s property value,” he said. The preliminary maps have been forwarded to local agencies and are available for public review. The review period, which includes a hearing in front of the State Mining and Geology Board, lasts until March 10. California Geological Survey will publish final maps after it considers comments from the lead agencies, the public and the State Mining and Geology Board. 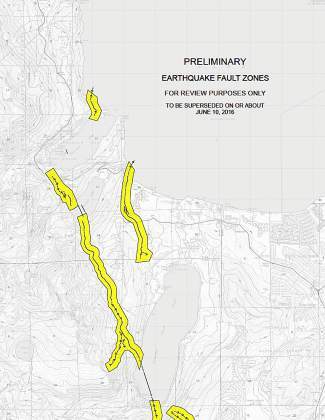 Notably, the maps do not include the other two fault lines below Lake Tahoe, considering they are on the Nevada side. According to past reports, the Incline Village fault line runs beneath the old K-2 elementary school off Southwood Boulevard, and is about 10 miles long. It is reportedly the smallest and least active of three major faults in the basin. The second and more active fault line is the North Shore fault line, which runs close to the Incline Village fault and through Crystal Bay. Sun-Bonanza Managing Editor Kevin MacMillan contributed to this report.